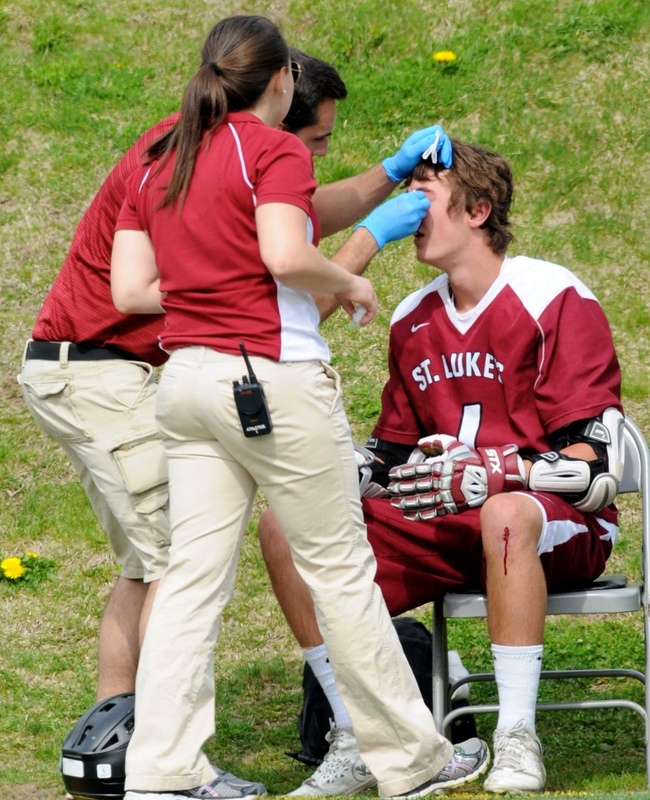 My son split open his brow last week in a lacrosse game, requiring a trip to the plastic surgeon and 11 stitches. He was told not to return to contact sports for 21 days. However, he is now 18 and considered an ‘adult.’ As such, he can decide to play at his own discretion – to a certain extent. Bob and I know better and, despite what the law deems, DO NOT consider 18 an automatic stamp of adulthood – far from it, especially for boys. We made the choice for him and made him sit out the next game. The coach wanted him to play and shared the story of a friend of his who superglued his wound together to return to a game. Message: Man up! That story made me think of an incident with my elderly father-in-law. A few years ago he fell off the kitchen chair he was using for a ladder to trim a tree in the yard. It seems that 92-year-old men have the same maturity and decision-making ability as 18-yr-old ‘men.’ Anyway, he landed on the concrete driveway scraping the side of his face badly. During the healing process his bottom eyelid was pulled downward by the scab and remained that way. He has an aversion to doctors so he chose to train his eyelid to return to its original position by lifting it with duct tape. After a number of weeks of wearing his improvised sling, he uncharacteristically admitted defeat and went to the doctor to have it properly repaired with a few stitches. Moral of the story: Duct tape may have 101 uses, but healing is NOT one of them. Too often, whether it is physical or emotional wounds, we are tempted to man up and get back in the game before we’re ready. Conversely, there are probably plenty of people who get stuck in the healing process and can’t find their way back onto the playing field. Regardless of which camp you fall into, and most of us have probably spent time in both, there is only one approach to the healing process – complete surrender. In order to get over it, you have to first lean into it. Whether it’s physical or emotional, returning to what the doctors refer to as ‘normal’ activities too soon will reopen the wound, often compounding the original injury. And frequently it involves accepting and adjusting to a new ‘normal,’ knowing your life will never again be the same. There is good reason we call those in the healing process patients – possibly the world’s greatest misnomer. In our nanosecond society, we are not a patient lot. We don’t have time. We prefer to choose to superglue our hurts and plow forward self-medicating in a myriad of ways. I can tell you from experience, it doesn’t work. As much as we’d like to slap on a duct tape Band-Aid, there are times when we need to choose to seek medical or spiritual assistance. Whether your great physician is wearing a white coat or the proverbial white robe, at some point we need to choose to put ourselves in their hands and let them do what they do best. At the prompting of a friend, I chose to attend a healing service this week. It was definitely out of my comfort zone and a little ‘out there.’ People have been trying to get me to healing services since my cancer diagnosis six years ago. 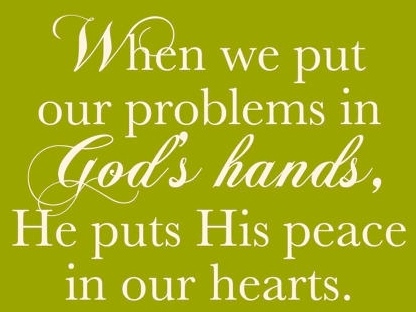 I’ve never felt the need for it thinking if God wants to heal me, He’ll do it in His own time in His own way. And I still believe that, but it wasn’t the cancer that prompted my recent acquiescence. When I approached a member of the prayer team, he asked me what brought me there. I told him and he asked an interesting question. He inquired, “Do you believe God wants to heal you?” At any point in time, what I am seeking healing for changes how I choose to answer. I believe God wants us all to live an abundant life and wants to heal us of anything that is preventing that possibility. My health situation doesn’t satisfy that criteria – quite the opposite.It is only through cancer that I’ve learned to live an abundant life, so I’d have to say that healing might not be His plan in regard to my physical illness. I don’t really know. It's not my choice, but I am totally comfortable leaving that decision to Him. God doesn’t heal everyone in the worldly sense. Why He chooses to heal some and not others is none of my business, but I do know it’s not because they haven’t attended a healing service or for lack of faith. Keep in mind our expectations of ‘healing’ can differ dramatically from God’s. My cancer has been its own kind of healing journey on more important fronts than any physical need. Nevertheless, because I firmly believe the issue at hand is precluding me from enjoying the abundant life, I answered with a resounding “Yes,” which brings up the next obvious question. “So why hasn’t He?” Because I haven’t chosen to surrender yet. Healing is a process in which we are expected to participate, even if it’s simply getting out of our own way—something I find particularly difficult to accomplish. It’s funny, for me dealing with a physical issue is so much easier. It’s black and white. I don’t really have a choice. I know what I have to do and gladly do my part by following the doctors’ instructions. I rely on their expertise for the most part, but have also learned to be my own advocate by reviewing and questioning every test result. On the other hand, I find spiritual healing much trickier. There aren’t any written scripts being dispensed. But then again, isn’t the Bible full of them? And why do I find it so much more difficult following God’s instructions? Am I as eager to review and question every test result? Not really, because I don’t always like what I see and the necessary changes those results would indicate need implementing. The one thing both types of healing have in common is that there are no shortcuts. Healing takes time and work whether it is a physical or spiritual rehabilitation. You need to choose to let the scar form and/or retone the muscles (faith is a muscle) before getting back on the playing field or you will find yourselves flat on your back, relegated once again to the sidelines. So what’s my point? Choose to be patient with your wounds and your recovery because God makes “everything beautiful in His time.” You’ll know His time has come when you can embrace the following precepts. Scar tissue is stronger than regular tissue, but only after it’s been given the proper amount of time and care to heal fully. 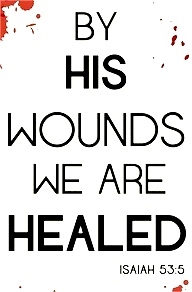 Even Jesus has scars, and the power to heal whatever ails us resides in them if we choose to surrender our will to His. Choose wisely.